Dorm room decorating is a lot of fun. It's stressful at first to think of all of the dorm essentials you need on your college dorm checklist, however once you figure out what you need, dorm room shopping and dorm decorating become your favorite things. It's fun to think of where everything will go in your college dorm room and plenty of fun to actually place every dorm necessities item in its spot. In fact, dorm room decorating is so much fun you probably wish you could dorm decorate all year round! You don't have to rearrange your dorm essentials in order to do some dorm room decorating all college year. Simply put up dorm room decorations for the holidays! Your holiday dorm room decorations for the Christmas season will start with your dorm Christmas tree. However, once you find the perfect college Christmas tree, you get to have fun picking out college supplies to complete your dorm room decor for the holidays. Your dorm room decor for the holidays is about more than your dorm Christmas tree. Wreaths are a pretty important part of dorm room decorating and can make your college dorm room feel even more like home. 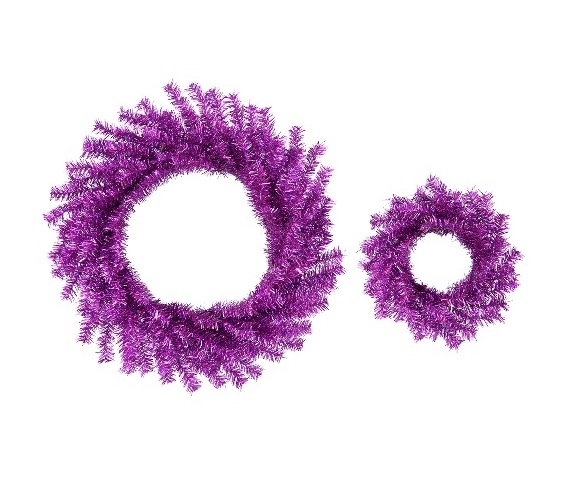 With our 10"/18" Purple Wreath Set, you can add extra color to your holiday decorations and you can place one of these dorm necessities on your dorm room door and one on your dorm room wall over your dorm desk for extra holiday college wall decor!